I have been pleasantly surprised of late to hear from a number of people who have taken all of the Making Math Real classes that the Kindergarten class was their favorite, especially from those who took the Kindergarten class last in their sequence of courses. Extremely curious as to why Kindergarten was their favorite, I asked each of them to please explain. The overarching response was that the Kindergarten class was their favorite because it felt like the most important of the Making Math Real courses since it was the source from where all of the Making Math Real methods started. Making Math Real: Kindergarten is an extremely valuable course because, as the earliest fundamental for the interconnected architecture yet to come, the Kindergarten class provides the foundational connections for all of the subsequent Making Math Real methods. Teaching students to independently solve word problems is at least a 10-year development spanning kindergarten through sophomore year in high school. Each grade year contributes specific developmental increments toward this overarching goal, and kindergarten gets it all started with the earliest developments of solving word (story) problems. In addition, the earliest developments of symbol imaging take place throughout the kindergarten year in helping students to image the numerals from 1-10, the names of the shapes, the names of the coins, etc. These kindergarten symbol imaging activities are the origins of the 9 Lines symbol imaging methodology and prepare first graders to use the 9 Lines to learn the doubles addition facts. By the end of kindergarten students need to be mentally able to increase and decrease single and double-digit numbers by one, especially in crossing 10s counting either forward or backward. The ability to mentally increase and decrease numbers by one provides the necessary neural structure for first graders to be developmentally ready to begin mentally integrating and applying the addition and subtraction facts. All of the above mentioned developments: counting, sequencing, decoding and encoding, comparing, mentally increasing and decreasing by one, and symbol imaging provide the necessary developmental supports for the working memory demands of first grade math. As kindergarten provides the earliest fundamental developments of working memory for math, it also provides helpful assessment insight for those students of any age who are not yet able to integrate these fundamentals. Recently, I have worked with numerous students from ages seven to thirteen, who at their initial assessments were unable to sustain one-to-one correspondence. In all these cases, the students’ inability to count (or any of the other significant developmental indications) was not observed and/or assessed by their respective schools, and all of these students were nonetheless subjected to ongoing attempts to teach them math. Until a student has achieved the earliest developments of number sense, formal instruction in math is not indicated because students are not able to establish effective working memory from which to learn. Consequently, everyone of these children was still at a pre-kindergarten level of math development, despite having attended school for years, while all involved educators were confounded by the “students’ inability to learn”. Understanding the fundamental kindergarten developments provides an effective baseline for determining possible indicators for why students beyond kindergarten age and with average intelligence are still not able to accurately count objects and/or images one for one. In the cases mentioned above there were strong correlations to significant under developments in sensory-motor integration, bilateral coordination, crossing the midline, proprioception, manual dexterity, muscle tone, sequencing, and in some of the cases, receptive and expressive language. All of these issues may indicate under developments in finger gnosis. As explained in the Making Math Real: Overview, finger gnosis, or finger knowledge, directly activates the left angular gyrus (AG) in the parietal lobe. Finger knowledge refers to deriving proprioceptive meaningfulness by using the fingers to count and helps all of us experience what various quantities feel like. This is how quantity enters the body, directly from finger touch and movement to the parietal lobes. The parietals deal with quantity and are known as the “math brain”. 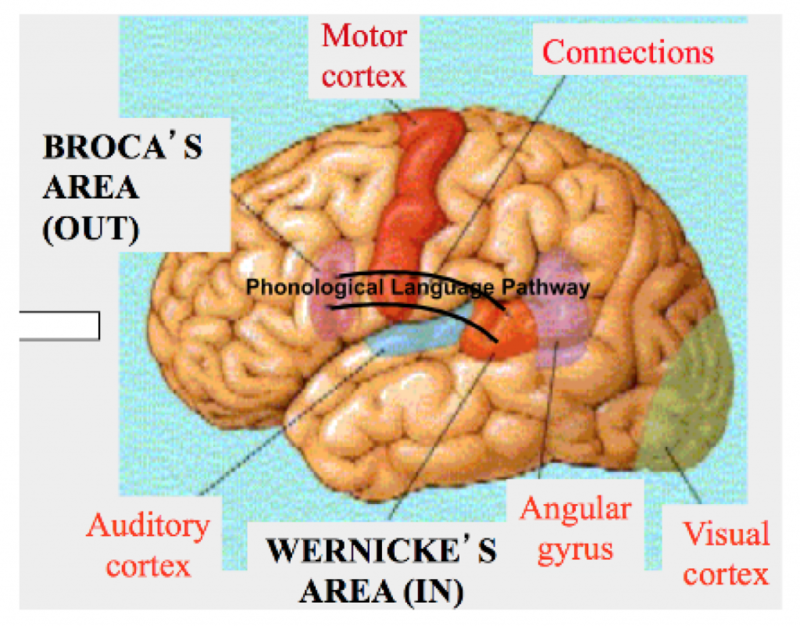 The left angular gyrus is also activated to encode the quantity experience in the parietals into language and is located near Wernicke’s Area in the temporal lobe, the area known for language input at the mouth of the phonological language pathway, and is itself the direct activation of the comprehension language pathway, both in the temporal lobe. 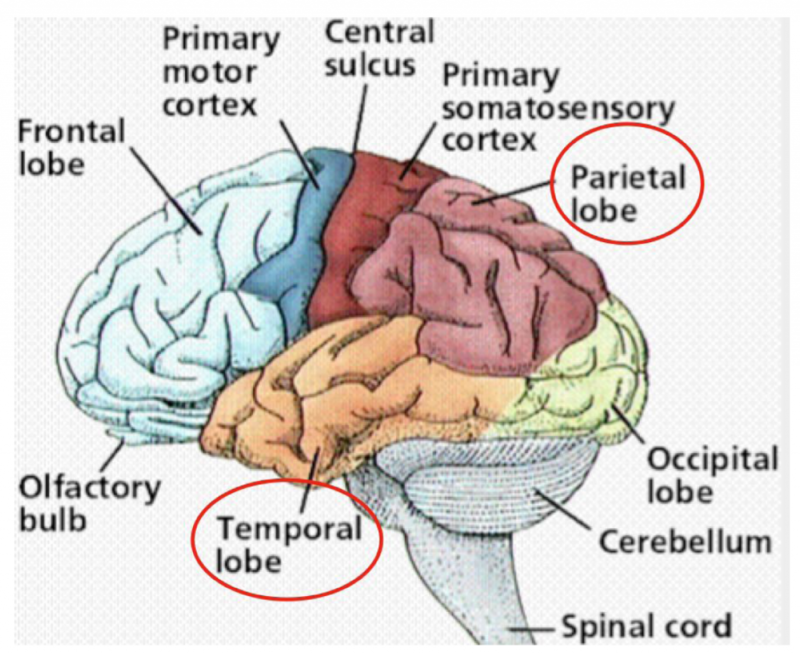 The temporal lobes are known as the “language brain”, and as also stated in the Overview course, the activation and development of exact math is a parietal-temporal integration. Therefore, from experiencing the concept of the math to expressing the math either in language or with pencil and paper, the angular gyrus is used for both, but development of the AG is required. However, if finger gnosis is underdeveloped, so too, might the angular gyrus be underdeveloped, which may contribute to a student’s ongoing inability to sustain one-to-one correspondence, and since the angular gyrus is also crucial to both the phonological and comprehension language pathways, receptive and/or expressive language may also be underdeveloped. If finger gnosis is underdeveloped and the student cannot sustain one-to-one correspondence, it is premature to begin any formal instruction in mathematics until a prescriptive, developmental intervention develops the finger gnosis-left angular gyrus activation connection that supports the ability to count accurately. Once one-to-one correspondence is established, then conservation of number and number-symbol relationship can be developed, thereby supporting the activation of sufficient working memory for the student to receive formal instruction in mathematics. I consider the k-2 sequence to be the most essential period for the development of mathematics as it relates to the development of number sense, sequencing, and especially, working memory. Underdeveloped working memory during the primary grade years can be a strong indicator of future struggles with math, and I have encountered innumerable students of all ages whose struggles with math could be traced back to under developments during the k-2 period. Therefore, we need our best and our brightest educators to be working with children at this invaluable developmental age, because in my experience, I have found it much more clinically challenging to appropriately and effectively foster these critical math developments in five to eight-year olds than it is to teach higher math to older students. Furthermore, I strongly believe, if we can successfully provide kindergarten through second graders with these necessary developments, we would see a profoundly positive change in the overall mathematics achievements of these children as they continue across the grades.